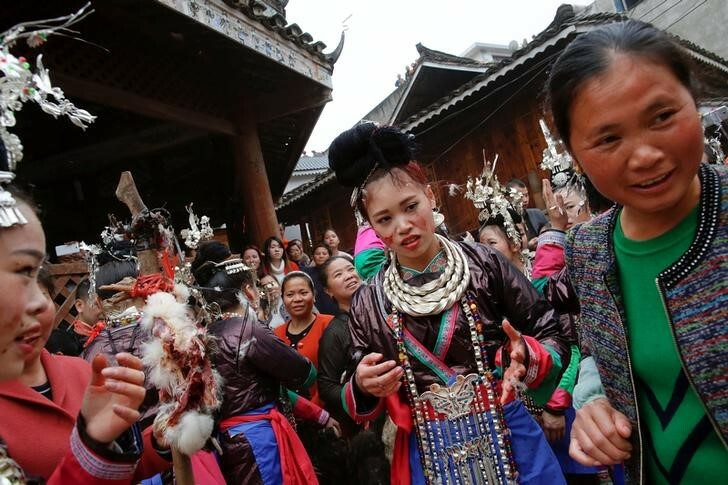 2 A village in southwest China staged a traditional wedding ritual this week that pits ancient traditions against modern views on animal welfare in a fast changing country. 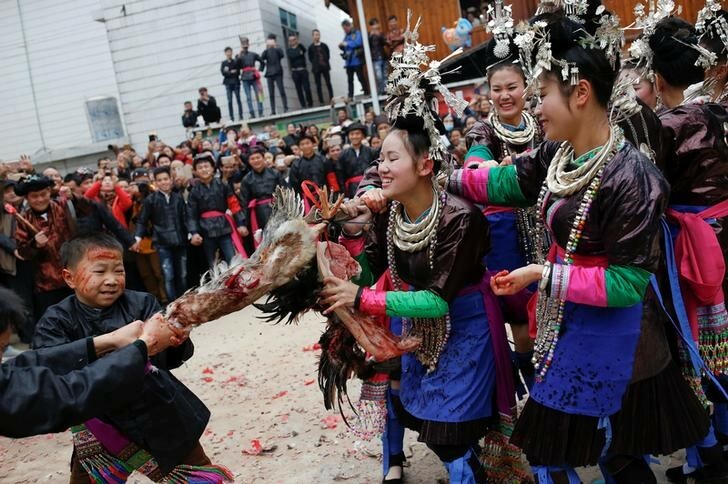 A village in southwest China staged a traditional wedding ritual this week that pits ancient traditions against modern views on animal welfare in a fast changing country. 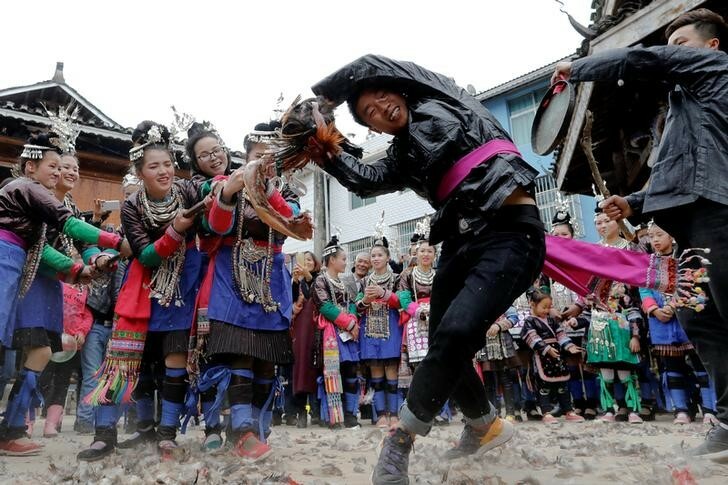 The ceremony held in the ethnic Kam minority village of Gantuan in Guizhou province is based on a tradition dating back some 500 years that was revived and modified in the 1990s for villagers and tourists. 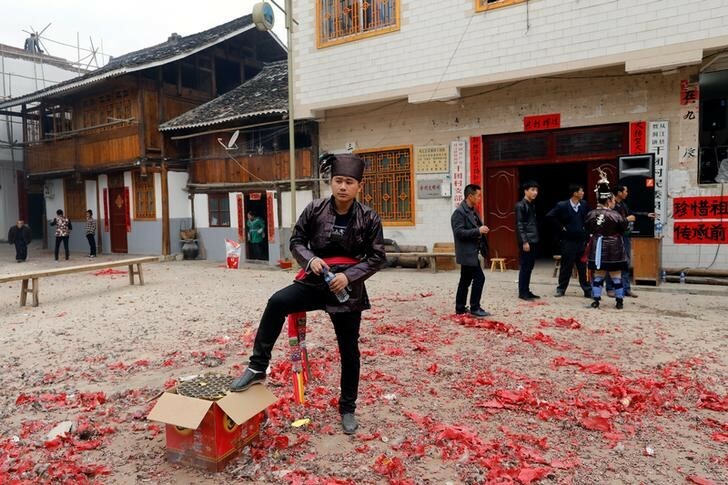 “I feel a little nervous and a little happy,” Shi Litao, a 26-year-old bride wearing heavy layers of makeup and a colorful costume, said before the ceremony on the Chinese New Year. 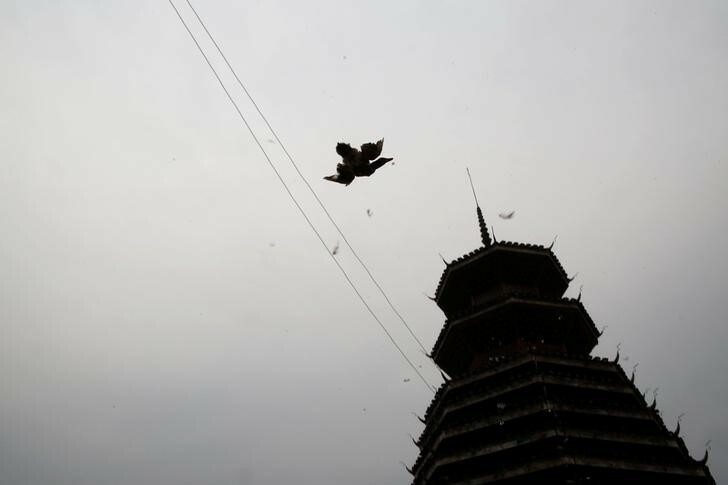 The event, known locally as “steal the chicken at the drum tower,” involves young men competing to be the first to tear apart live birds carried on poles by new brides into the village center. 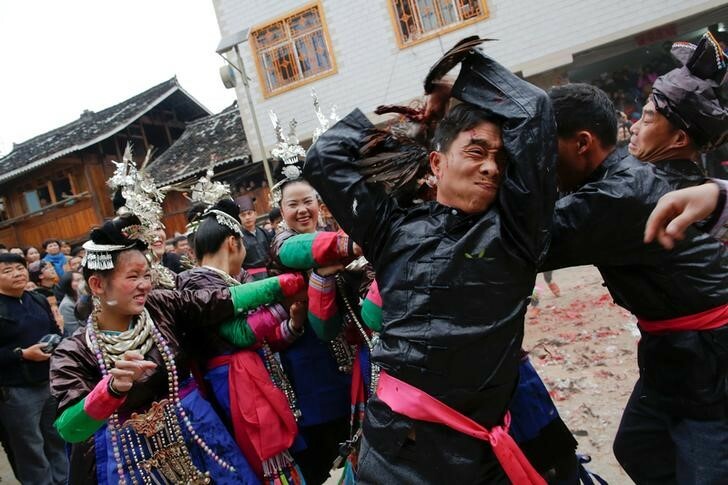 It is rooted in the past when a bride was expected to marry a cousin, according to village chief Huang Xuexian. 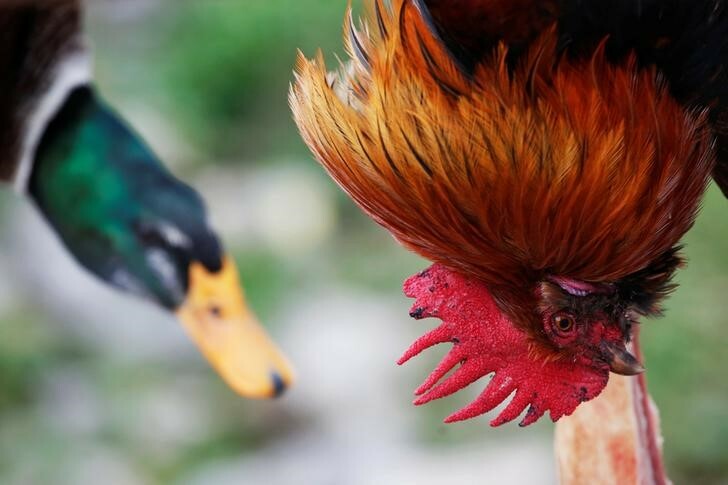 If she wished to marry outside the family, her suitor and cousin would compete to be the first to bite off the head of a tethered chicken or duck and “win” the bride. 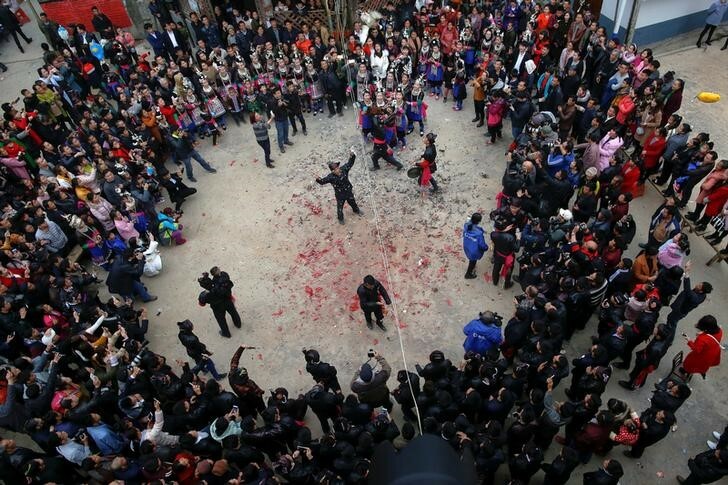 This ritual was abandoned long ago as attitudes on marriage changed, said Huang. “It was later that people realized this was not the correct way to marry. Now we have the freedom to marry whom we want,” he said. 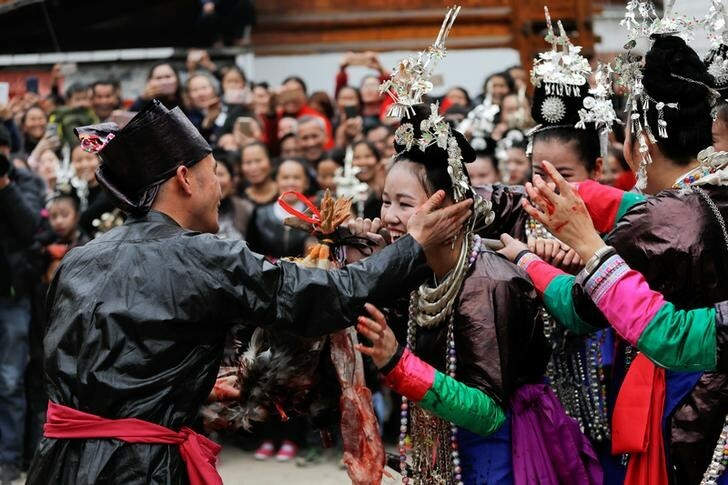 In the 1990s the village introduced a modified version of the ceremony that still involves young men tearing the live birds from the poles carried by the brides. Huang defended the ceremony, saying there had been no public opposition to the annual event. “This is our custom and this has never generated any controversy,” he said. Pet ownership and better education on animal welfare have fueled greater public sympathy for animal rights, activists say, but legal protection proposed in 2009 has not been implemented.